Nana’s Holiday House is opening its doors for the 6th year at 175 First Street (formerly Mr. Believable’s & The Rumor Mill). Now a Friday Harbor tradition, Nana’s House provides a place for Kids, 18 and under, to do their Christmas shopping at the affordable price of $1.00 to $10.00. All of the items are new or hand crafted. The kids come in with their list and purchase special gifts for their families, teachers and friends. There is a wrapping station with helpers and an area where parents of the little ones can munch on baked goods while their kids shop for secret gifts and have their gifts wrapped. Jeanine Earnhart (Nana) remembers sitting in her car at the old dime store in Friday Harbor, Sprouse Reitz, when her kids were young. They would spend ½ hour and $20 shopping for parents, teachers, friends and other family members. They learned about the joy of giving while the excitement of the recipients opened their well thought out gifts on Christmas morning. It brought a lot of joy and Christmas spirit to the holidays to everyone. Jeanine, her daughter Laura Earnhart Holden and friend Debbie Cutting opened for the 1st time in 2013, and through the generous donations of items and retail space, have been open in various spots around town every year since! All the proceeds from Nana’s House go back to the community. 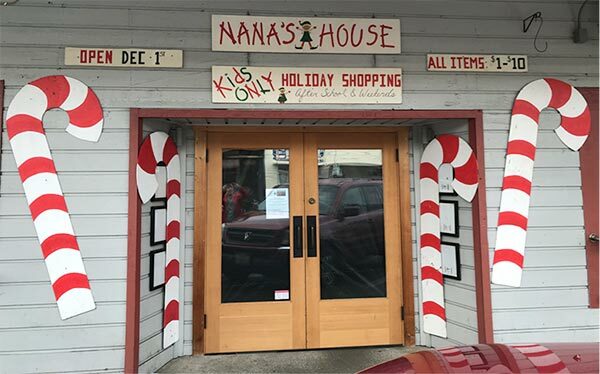 Scholarships, school supplies, swimming lessons, food and gas cards to the family resource center & domestic violence, electric bills paid and help for island families going through tough times are just a few of the recipients of Nana’s House profits. Nana’s house is open from the 1st through the 23rd of December. Hours are 3-5 on school days (and early outs) and 11-5 on Saturday and Sunday. The last day of Nana’s House, the 23rd is open to the whole family. Even SANTA shops for stocking stuffers at Nana’s House. For more information, visit the Facebook page at Nana’s Holiday House in Friday Harbor, or call 317-4489.